Euan Mullock in Editor's Picks World Affairs on 1 November, 2016. An ‘October surprise’ can make or break a U.S. presidential election. Republican nominee Donald Trump’s leaked tapes containing sexist remarks at the beginning of last month raised questions about his integrity and respect for women, and made many think that his campaign was all but over. However, his ferocious attacks on both his Democratic opponent Hillary Clinton and her husband former President Bill Clinton during the second presidential debate and questions about the former Secretary of State’s emails put the race back in play. With just one week left to go – what’s the state of play nationwide? 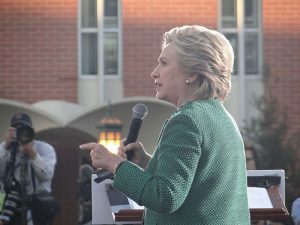 After Clinton’s widely-lauded performance in the three presidential debates her lead in the polls widened, to a high of nine points over Trump in the national polls in the second week of October, and a small but steady lead in the majority of the country’s swing states – states which are not solidly Democratic or Republican and always decide the election. Two weeks later and seven days out from the election, and as normally happens, the polls have started to narrow. NBC’s poll of polls, which averages the result of the five most recent national polls, has Clinton leading Trump by five points, 47-42, unchanged from the previous week but likely to narrow from early October’s largest gap before next Tuesday’s vote. She also leads him in several crucial swing states, including by six points in Pennsylvania, three points in North Carolina, is two points ahead in Nevada and just a point up in the perennial battleground state of Florida. Swing states matter because they alone can decide the outcome of an election. George W. Bush eked out a narrow win in 2000 by carrying Florida; Barack Obama’s 2012 victory was thanks to a few thousand votes in Ohio, Virginia and Florida, too. This election sees familiar swing states such as Ohio, Florida and Virginia in contention, as well as some new ones such as Utah, Arizona and Wisconsin. Because these swing states can not easily be called for the Democrats or the Republicans before the election takes place, they benefit from a barrage of election ads – which bombard the airwaves for months – as well as millions of dollars of investment and high-profile visits from both candidates and their surrogates as they seek to win every last vote. Last week First Lady Michelle Obama was stumping for Hillary in North Carolina, primary rival Bernie Sanders was in New England, and the President himself is holding a rally for the Democratic nominee in Florida this Thursday in an effort to deliver her a crucial win in the Sunshine State which would almost certainly be a devastating blow to Trump’s presidential aspirations. As Clinton looks increasingly likely to lock in North Carolina’s 15 electoral votes and flip the Tar Heel State back into the Democrat’s column after Obama lost it in 2012, Trump is also seeking to swing states Obama won in 2008 and 2012 to the Republicans. Nowhere is he more likely to do this than in two Midwestern states – Iowa and Ohio. Both states have fewer Latinos, African-Americans and whites with a college degree than the national average, three crucial demographics that help shore up Democratic support nationwide, and nowhere does Trump’s rhetoric appeal more to blue-collar workers than here. Polls aggregated on RealClearPolitics have him leading in Iowa by two points and in Ohio by just over one, and it’s imperative that he carry both states to stand a shot at taking the White House. However, this is still unlikely, but increasingly possible, with Clinton at a 75% chance of taking the White House as of last night according to fivethirtyeight.com. Indeed, there remain, as there always have, fewer paths to the Oval Office for Trump as there are for Clinton. The ‘Blue Firewall’ – a score of states from California to New York that will almost certainly back Clinton on November 8th – put her automatically within touching distance of the 270 electoral votes needed to win, without a single ballot being cast. 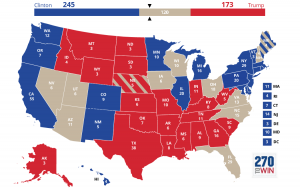 Trump’s ‘Red Fence’ number more states, but much less populous ones and with fewer electoral votes to offer, meaning he has an uphill task to win before the race even begins. 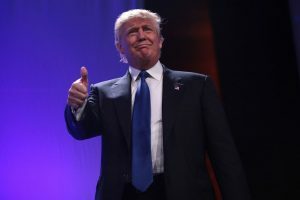 In order to deliver a Trump victory, he must flip several states that voted twice for Obama in 2008 and 2012, such as Iowa, Ohio, Florida and Virginia, as well as turn some which have not voted Republican for decades, including Wisconsin, Pennsylvania and New Mexico. As well as this difficult task, he must ensure he holds Clinton in North Carolina, and every state which Republican candidate Mitt Romney won in 2012 – no mean feat as polls show a dead heat in many of these such states, including Arizona and Georgia, and show him struggling to fend off an unusual challenge from an independent candidate in Utah. There’s still time for a substantial upending of the race (again), but the clock is fast running out and 12 million Americans have already cast an early ballot. News broke yesterday of a possible email link between Trump and Russian banks, with many seeing this as a possible reason why he is the first presidential candidate in a generation to fail to release his tax returns. Friday night’s bombshell that FBI director James Comey is looking into possible new emails from Clinton’s long-running server saga could materialize into something much more serious before next Tuesday’s election. Questions remain about the integrity of both presidential candidates as we enter the final week of a race that started way back in April 2015. While the result is not yet certain even as millions cast their votes nationwide and as polls tighten across the country, one thing is for sure about this election – most of us will be glad to see the back of it.